Rich and fudgy chocolate orange brownies recipe with chocolate frosting that’s made from scratch, using simple ingredients. Easy to make and very decadent. These QUICK and EASY chocolate orange brownies prove that fruits and chocolate were meant to go together. Seriously, these brownies are super FUDGY, very MOIST and packed with intense CHOCOLATE flavor that is complimented by citrus flavors…YUM! I modified one of my sister’s fudge brownies recipe to come up with this DECADENT dessert that’s great for Spring and Summer parties. 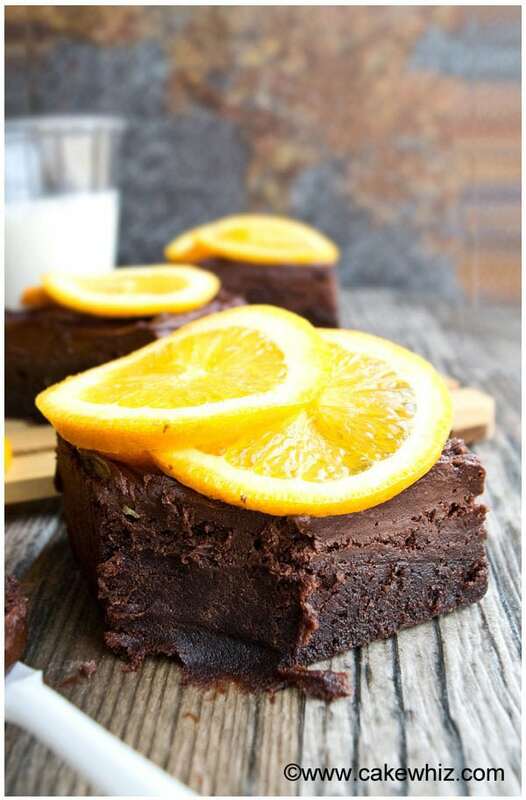 To be honest, I was a little worried that the use of oranges might give these brownies a medicinal aftertaste. 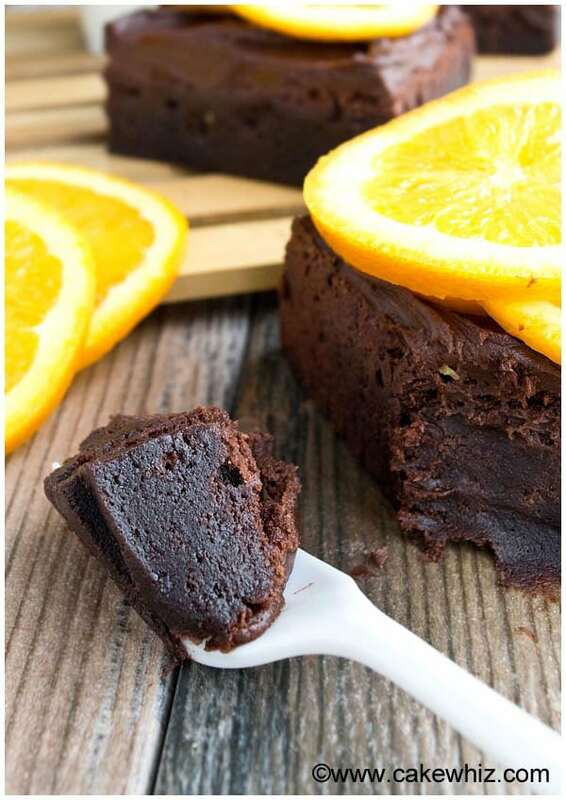 After making these brownies a few times and TESTING different quantities of ingredients, I was able to successfully make the perfect batch of chocolate brownies with orange zest and orange extract. Both, cocoa powder and chocolate chips are used in this recipe. Don’t omit one or the other. They are both required for the perfect fudgy brownie texture. 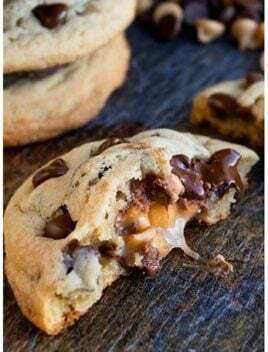 In this recipe, you can use semisweet chocolate chips OR milk chocolate chips. I don’t recommend using dark chocolate chips since it’s too bitter and over-whelms the overall flavor. I prefer using orange emulsion oil since it’s stronger and doesn’t evaporate while baking. However, if you don’t have that, you can easily use orange extract instead. Don’t omit the orange zest. It adds a wonderful fresh aroma to these brownies. 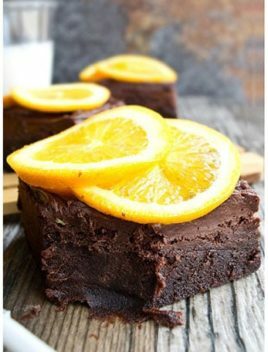 These simple chocolate orange brownies can be decorated with thinly sliced oranges, candied oranges or even a dusting of powdered sugar. 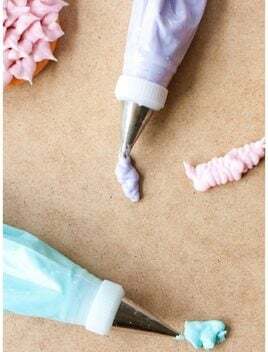 DON’T use wax paper to line the cake pan. The brownies stick to it and it’s a mess! I suggest lining the pan with aluminum foil and spraying it with a little bit of oil. That makes it very easy to remove the brownies, once they have cooled down completely. I prefer really fudgy, almost under-cooked brownies BUT if you are not fond of that, you can bake for a little longer. TECHNICALLY, your brownies are ready when a toothpick inserted in the center comes out almost clean with some crumbs. It should NOT be dripping with batter. If your inserted toothpick comes out dry, you have over-baked your brownies and they will have a more “cake-like” texture. To make chocolate brownies with orange icing, use this orange buttercream icing instead of chocolate frosting. To make white chocolate orange brownies, stir in about 1/3 cup white chocolate chips in the batter and top off the brownies with this white chocolate buttercream frosting. Leftovers can be STORED in a sealed container in the fridge or at room temperature for up to 2 days. If you are storing in the fridge, leave the brownies on the countertop for a few minutes to come down to room temperature before digging in. 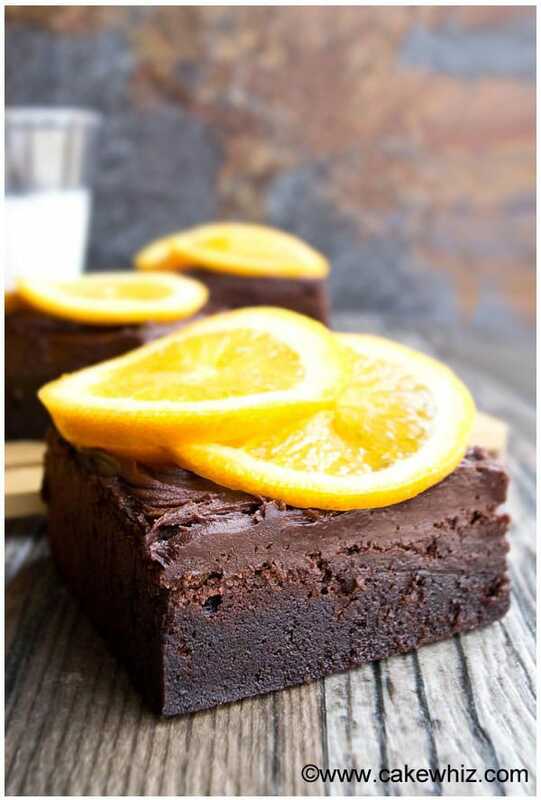 How to make chocolate orange brownies? The process is a little different than my other brownie recipes. Start off by melting the butter and chocolate chips together in a bowl. Now, mix in the sugar. Then, mix in the eggs. Mix in the extracts and zest. Finally, add the flour and baking powder and mix until just combined. Stir in nuts, if you like. Spread this brownie batter into a square pan. Bake at 350 degrees for about 30 minutes. When the brownies cool down, spread chocolate frosting. Cut slices and decorate each slice with thin orange slices. Enjoy! Rich and fudgy chocolate orange brownies recipe with chocolate frosting that's made from scratch, using simple ingredients. 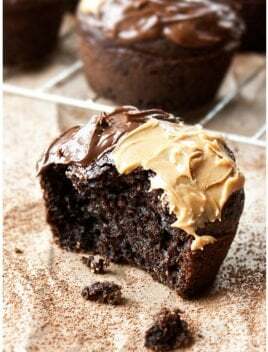 Easy to make and very decadent! In a microwave safe bowl, add chocolate chips and butter. Heat in the microwave at 30 second intervals until everything has completely melted and you have a smooth mixture. Dump this chocolate mixture into a mixing bowl. Add sugar and mix until everything is thoroughly combined. This mixture should not be boiling hot! Add eggs, vanilla extract, orange extract, orange zest and mix until just combined. Add cocoa powder and mix until just combined. Slowly, add the flour and baking powder and mix until just combined. The batter will be thick! Gently, stir in any add-ins you like. 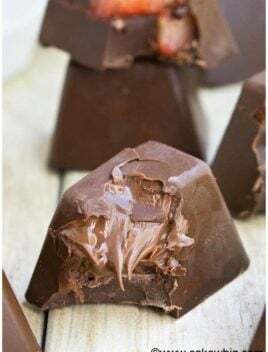 Pour this brownie batter into a square cake pan (Dimensions: 9×9) that's been lined with foil paper and sprayed with oil. Bake at 350 degrees for 28-30 minutes. When these brownies have cooled down, spread chocolate frosting all over the top and cut them into square pieces. Decorate each slice with a couple of round orange slices. Leftovers can be stored in a sealed container in the fridge or at room temperature for up to 2 days. Yummy!! Looks very decadent! Can I use orange juice instead of extract? If yes then how much? Thanks for the recipe. No, I am sorry but the juice doesn’t have the same fragrance and flavor as the extract. You need to use that extract. 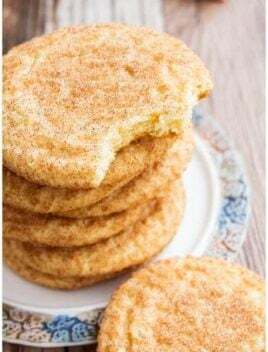 If I make this in a 9×13 pan will they come out too thin? 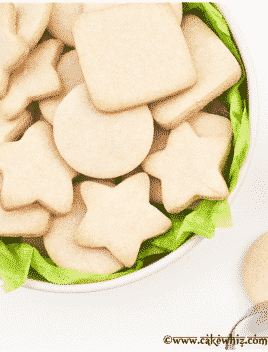 I don’t have a 9×9 pan, but I really want to make these! Yes, that’s a big pan and they will be thinner and I feel thinner brownies are never fudgy.